Electricity from wind and solar requires systems that store electricity that will be needed at a later stage. In November the Fraunhofer Institute for Wind Energy and Energy System Technology (IWES) in Kassel tested the prototype of a storage system in Lake Constance, Europe's largest drinking water reservoir. 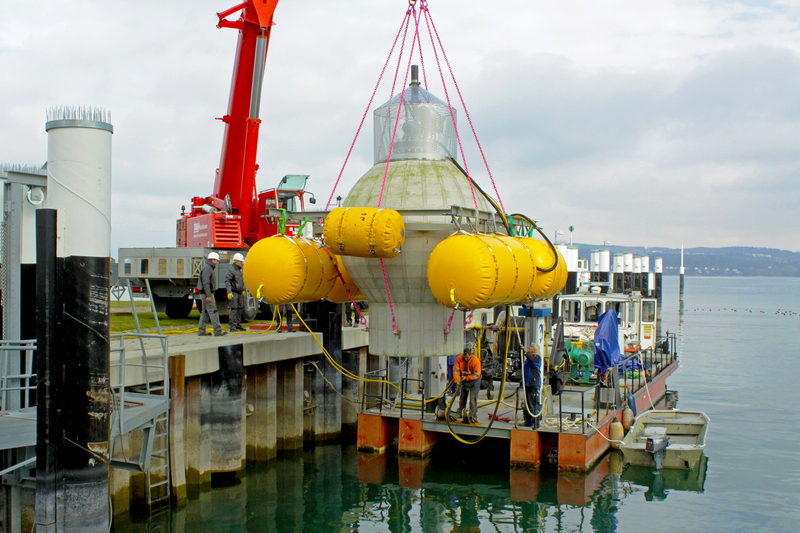 A hollow sphere storage system positioned 100 meters deep is designed to demonstrate feasibility in a simulated service test. ContiTech supplied the pressure equalization line for the testing of this novel underwater pump reservoir. The principle of the hollow sphere storage system is the same as that of conventional pump storage power plants – except that it doesn’t use two basins. The novel pump storage uses the sea itself as its upper storage reservoir. The lower storage basin is formed by the hollow sphere on the seabed. When electricity is needed on shore, a valve at the opening of the sphere opens. The water flowing into the sphere powers a pump turbine that generates electricity via a generator. The current is then transmitted to shore via connecting cables. Excess electricity, such as any generated overnight, is used to pump the concrete sphere dry again. The hoses used as pressure equalization lines in the test model of the novel hollow-sphere storage power station were developed and manufactured by ContiTech in Korbach. Air can flow into the sphere through the hose when water is pumped out. That prevents insufficient pressure. The Fraunhofer IWES in Kassel started the first test phase on November 9, 2016. This involved lowering the 20-metric-ton hollow sphere to the bottom of “the Swabian sea”, as Lake Constance is sometimes referred to in German, near Überlingen. During the four-week test researchers were able to successfully prove and test the function of the underwater pumped storage power station. As its next step, the Fraunhofer Institute plans another experiment with a large plant at a water depth of approx.700 meters. The difficulty is finding a suitable location that is close to land. This is necessary for technical reasons. Proximity to an offshore wind farm is less important. The only requirement is that a shared electricity network is used. N.B. The information contained in this entry is provided by Contitech, and does not necessarily reflect the views and opinions of the publisher.